KEENETSON OF A NEWLY PUBLISHED BOOK. 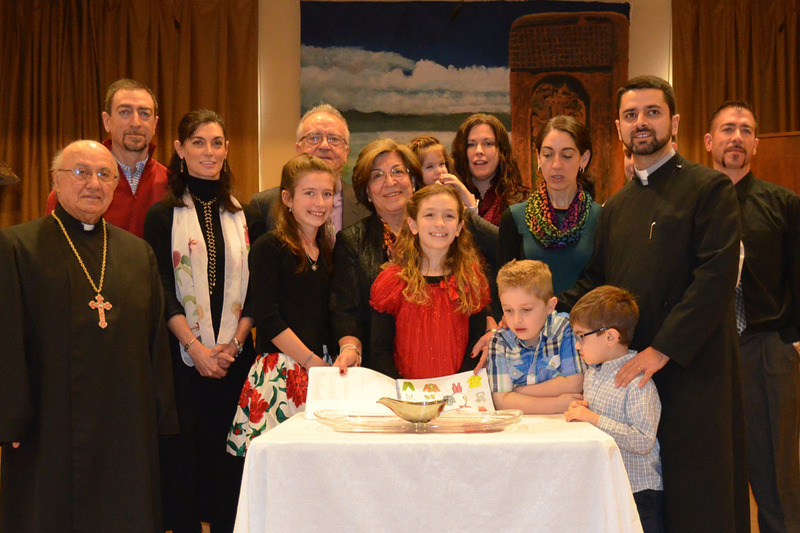 On Sunday, December 14th, 2014, St. Gregory Armenian School hosted a Keenetson, A Book Debut for Mrs. Marie Azezian Yapoujian’s “I Will Speak Armenian”, “Ես Հայերէն Պիտի Խօսիմ” newly published book. After the Badarak, parishioners were treated to a lavish coffee hour. The event started by an explanation of the word Keenetson by Maria Bedonian. She mentioned that the word Keenetson is a compound word formed from the root nouns kini which means wine and tson which means to consecrate, to dedicate, to gift. This tradition was passed on to us from pagan times when they only used wine as a gift to celebrate the gods. Now it is used for ordinary occasions including to celebrate a books debut. Books for the Armenian people have been Holy and sacred relics because they protected our existence through centuries. So, when wine is poured on a newly published book it symbolizes that the book has been consecrated, devoted, it had become a present carried to the gods. There is a possibility that Keenetson has a religious meaning to it as it marks the birth of another publication. Interestingly, the wine pouring tradition is not practiced in Armenia. Then Fr. Karekin Kasparian spoke about Mrs. Marie Yapoujian and her dedication to teaching and continuing to find new methods and tools to pass the Armenian language to the next generations. He also mentioned that this was the first Keenetson celebrated in our church. Mrs. Marie Yapoujian was very touched and she thanked the school staff, her children, grandchildren and colleagues for encouraging her and supporting her to compose and print this book. Then the wine was poured on various pages of the book by few staff members of the school, Fr. Karekin, Fr. Mesrob, Mrs. Ann Daw and Marie herself. After that Fr. Mesrob Hovsepyan congratulated Marie for her new publication and in his remarks emphasized the importance of the publication and its usefulness in our Armenian School which will continue educating generations of the Armenian descent. The day ended by Jacqueline Schmeizl singing an Armenian song dedicated to her grandma Marie and by cutting the cake. Congratulations Mrs. Marie Azezian Yapoujian.